From the bestselling author of She’s Not There comes another buoyant, unforgettable memoir—I’m Looking Through You is about growing up in a haunted house...and making peace with the ghosts that dwell in our hearts. For Jennifer Boylan, creaking stairs, fleeting images in the mirror, and the remote whisper of human voices were everyday events in the Pennsylvania house in which she grew up in the 1970s. But these weren’t the only specters beneath the roof of the mansion known as the “Coffin House.” Jenny herself—born James—lived in a haunted body, and both her mysterious, diffident father and her wild, unpredictable sister would soon become ghosts to Jenny as well. 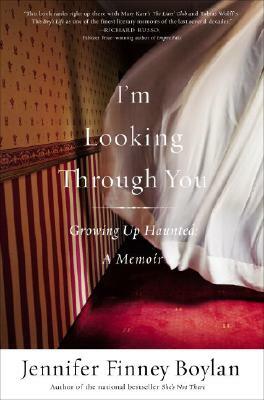 I’m Looking Through You is an engagingly candid investigation of what it means to be “haunted.” Looking back on the spirits who invaded her family home, Boylan launches a full investigation with the help of a group of earnest, if questionable, ghostbusters. Boylan also examines the ways we find connections between the people we once were and the people we become. With wit and eloquence, Boylan shows us how love, forgiveness, and humor help us find peace—with our ghosts, with our loved ones, and with the uncanny boundaries, real and imagined, between men and women. Jenny Boylan’s I’m Looking Through You ranks right up there with Mary Karr’s The Liar’s Club and Tobias Wolff’s This Boy’s Life as one of the finest literary memoirs of the last several decades. Like these, it’s a haunting revelation of the human heart, its terrible longings, its fears and joys, the secret recesses where we most truly dwell. How alike we all are, down this deep. Consider the book's title and subtitle. How have specters and living beings served as windows for one another throughout Jenny's life? Growing up, what did she see as she looked at herself? What solidarity does Jenny find with the spirits that populated the Coffin House? How have her relationships with the ghosts changed, and in what new ways does the present day Jenny describe being haunted? What did Jenny's relatives and their friends teach her about gender roles? How did their particular outlook on life affect her choices? How did their tone affect her written voice? Could you hear echoes of any of the people she describes in Jenny's own words? Discuss the Coffin House itself. What were your first impressions of the house? How did the transformations in the décor reflect the family's evolution? In what ways is the house a fitting home for the Boylan family? What was the effect of the book's narrative structure? How did it impact your reading experience to see echoes of the past in the present and vice versa? What do you think was the author's intention in doing this? Do you agree with Grace's statement that, "If you want to make any sense of this world, you have to live in the gray"? (p. 124) Is this a philosophy that appeals to you? Why do you think that so many of us are uncomfortable in the gray? What makes Grace different from the other women who have been a part of the author's life thus far? Can you pinpoint what you see as the key to the endurance of their relationship? What does Jenny convey in her descriptions of Grace that lead you to this conclusion? How do the musical references in I'm Looking Through You form a soundtrack for the narrative? What role does music play in the author's life, and how do you see this portrayed in the book? How do you think you would have reacted to the ghosts Jenny meets? Have you experienced contact with the dead? If so, how did the memories of your own encounters impact your reading experience? If not, did Jenny's stories in this book have any effect on your beliefs about the spirit world? Consider the parent-child relationships in I'm Looking Through You. What do you make of the author's relationship with her parents? What aspects of Jenny's own personality are reflections of her parents, as she describes them? How is the way Jenny relates to her sons similar to or different from the relationship she had with her parents? One of the most painful experiences Jenny discusses is her estrangement from her sister. Why do you think Lydia's reaction to Jenny's transition is so different from her mother's? From the descriptions of the siblings in happier times, would you have anticipated this reaction? What, if anything, do you think it would take for the two of them to reconcile? In "Reunion," Doober says it would be excellent to "find your kid self" and force a conversation with that shadow of your past, and Jenny asks him if he would warn himself about the future. Given the opportunity, what would you say to your younger self? Discuss Jenny's musing that "houses don't have ghosts. people do." How do you see this manifested in I'm Looking Through You? The "ghosts" of many relatives populate the memoir's closing scenes, including those of Jenny's father and sister. Are there significant people who are absent from your life? What traces did they leave behind? Consider the theme of secrets in I'm Looking Through You. What factors determine who Jenny reveals her ghostly encounters to? What about the secret of her true female identity? Why do some believe easily, while others remain unconvinced? What determines a person's reaction to surprising news? And how can we know when it is time to reveal our secrets? Are you familiar with Jenny Boylan's first memoir? If so, how do you see the two books as companion volumes? What does I'm Looking Through You add to the story you read in She's Not There and vice versa? How do they complement each other, and how do they differ?